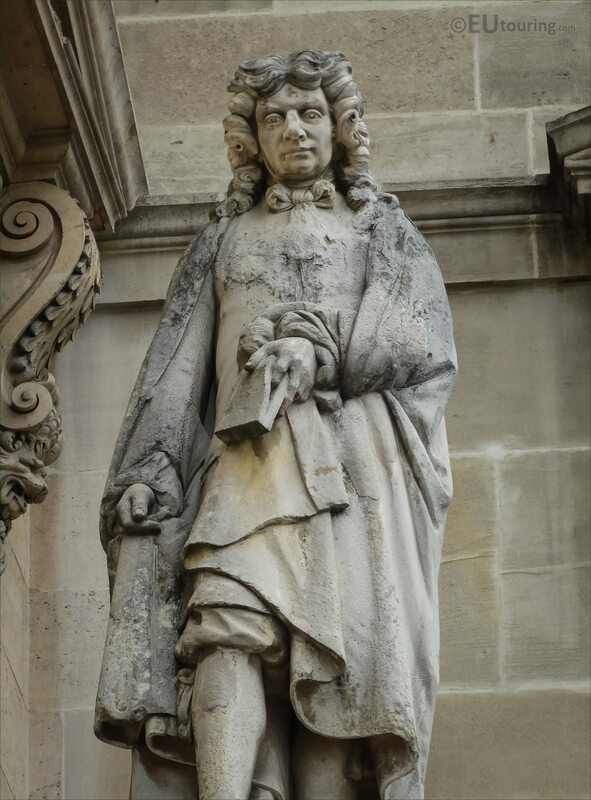 Again, we were still admiring the facade of the Aile en Retour Turgot, which is a part of the Palais du Louvre situated in the Cour Napoleon in the 1st Arrondissement, when we took these HD photos of a statue of La Fontaine sculpted by Jean-Louis Jaley. 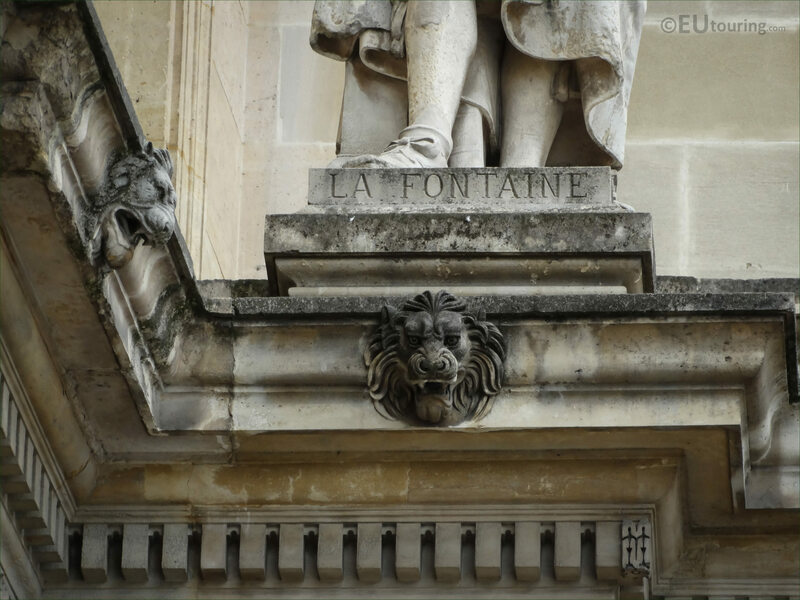 As you can tell from this first high definition photo, the stone statue of Jean de la Fontaine is the very first one positioned on the first level of the facade called the Aile en Retour Turgot, which actually looks out towards the Cour du Carrousel next to the Pavillon de Rohan, even though it is classed as being a part of the Cour Napoleon section of buildings of the Musee du Louvre. Now this is a close view of the stone statue of La Fontaine, which was produced in 1857 by the French sculptor Jean-Louis Nicolas Jaley who was born in Paris in 1802, and you can discover numerous sculptures he executed dotted around Paris, such as on the Gare du Nord and the Palais de Justice, and he was awarded the Legion of Honour in 1856. 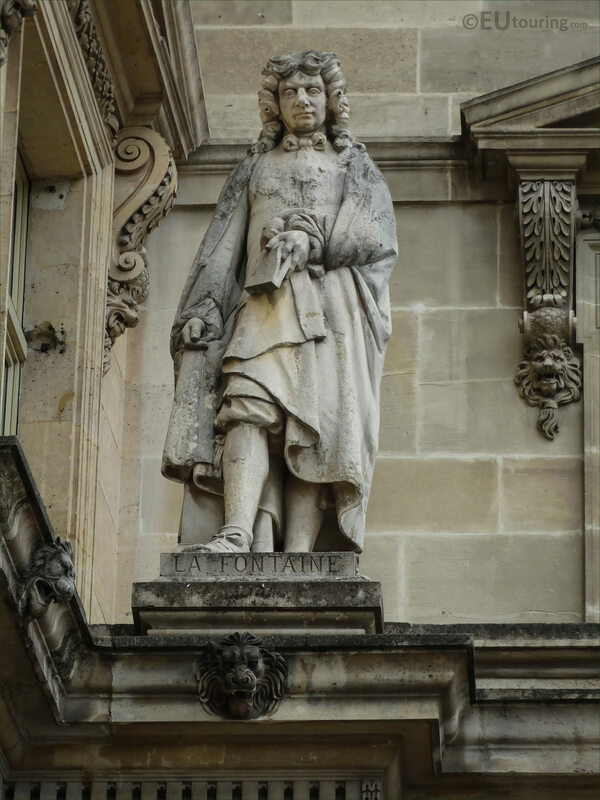 And in this last image you can see a close up showing the name of the person that this statue is dedicated to, and Jean de La Fontaine was born in the July of 1621, becoming the most famous French fabulist, which is a writer or re-counter of fables, and he was the most widely read of all 17th century French poets, with his fables being what La Fontaine became known for, even prior to passing away in 1695.